Although German at first appearance, this 16 ½” ( 42cm ) bisque character head doll is American made, thereby placing her in the “ miscellaneous “ category by default. She is made in New Jersey about the time of World War I as the importation of the nearly ubiquitous German dolls came to a quick and abrupt end. As observed, she greatly resembles the dolls produced by Gebruder Heubach and despite the comparison she is not an exact copy of any of theirs but closely resembling their so-called “singing girl“ and having all molded and painted head and facial features with a fully incised “ FULPER “ signature on back of head in a vertical design with the “ F” on top and the “ R” at the very bottom. In addition there is an incised triangle logo and some other markings that are difficult to decipher. The head is mounted to a very nice pink fully jointed wood and composition body with straight wrists ( all with good original patina ), and costumed in a very simple white cotton dress with antique underwear, antique white leather shoes with buckles and old pink knit socks, and an antique red wool overcoat with black braid and lace trim ( a few typical tiny moth holes as might be expected due to the old material involved ). 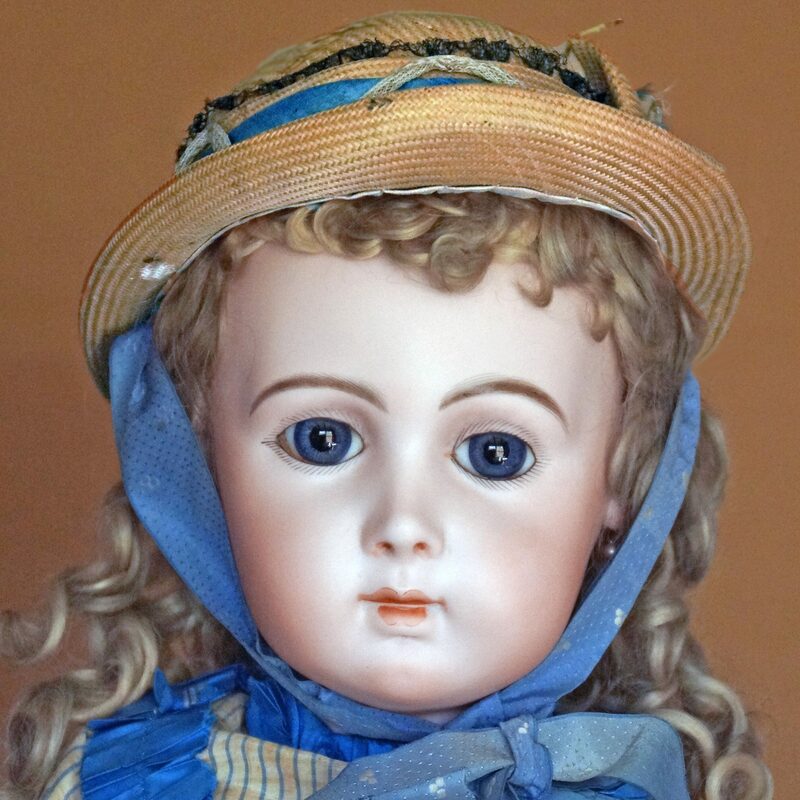 A very nice doll, extremely rare to find, and “ Heubach-like “quality of production! !……………………SOLD.